We reached Cuchamano on the Zimbabwe border at 7:30 yesterday morning, and it took two and a half hours to cut through all the red tape and finally enter the country. We proceeded through all sorts of convoluted formalities – off the truck to receive exit stamps out of Mozambique, back on the truck, off again to show our yellow fever vaccinations, back on the truck, off yet again to receive our visas to Zimbabwe, back on the truck. At this point, I was called into the immigration office again because the official had forgotten one of the stamps in my passport. Back on the truck once more, and then we had to wait for a long time while the border police questioned our driver, who was accused of paying for his visa with counterfeit bills (which are disturbingly common here). As Zimbabwe's currency was utterly destroyed, the country now uses U.S. dollars, so some people asked me to check their bills to make sure they were not counterfeit. we got off the truck again so it could pass through the border empty, walked through the border, showed our passports yet again, and finally boarded the truck one last time. The mission statement of the immigration post, displayed next to a poster of Robert Mugabe, is to be one of the most efficient border crossings in the world. Ha! It took almost four hours to reach Harare, the capital of Zimbabwe. Although Zimbabwe has been devastated in many ways in recent years, its infrastructure has remained intact, and Harare is probably the most developed city we have seen in Africa so far. We stayed at Kuimba Shiri Bird Park on Lake Chivero, about 25 kilometers west of the city center. The area is teeming with wildlife, including more species of birds than North America and Europe combined. Waterbirds gathered near the reeds along the shore of the lake. Of course, swimming in the deceptively inviting water would be foolish due to the many recent crocodile-related deaths. 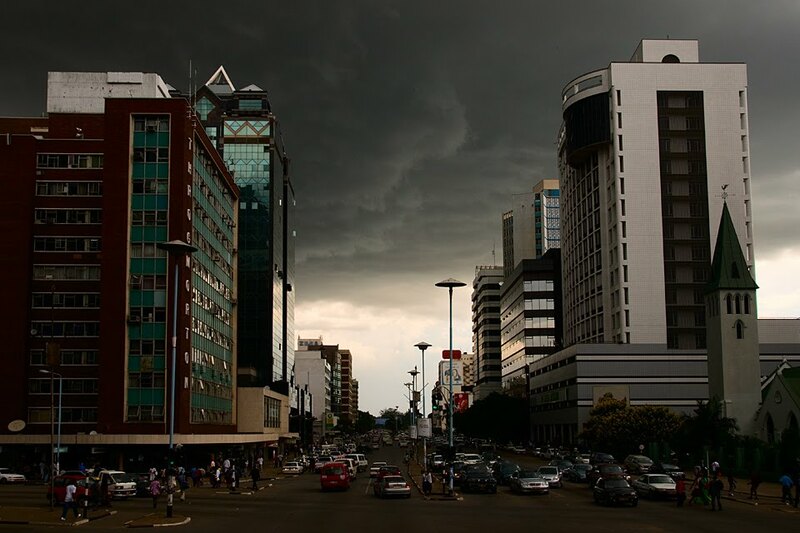 A storm brews over the city center of Harare, the capital of Zimbabwe. In the evening, we had a costume party, wearing hilarious and embarrassing garments that we bought for each other at a market in Malawi. Most of us upgraded to the shared dorms – it's nice to have an actual bed sometimes, although mosquitoes are more of an issue since there is no protection from a tent. The power and water go out often in Zimbabwe, and it was frustrating to coordinate showers – the water was completely out by the time it was my turn for one, but I managed to have one this morning. After breakfast, a few of us wanted to go into Harare, so we walked to a "bus stop" on the nearby highway that was really just a bunch of locals standing by the side of the road. A group of Zimbabweans waved down a combi (a sort of shared van), but it was too packed for us to fit. More people climbed into the backs of pickup trucks that served as taxis, but they were piled almost on top of one another. Finally, an empty pickup truck stopped when we waved it down. A man was driving, and a woman holding a toddler sat in the passenger seat. It was not a proper taxi, but just a friendly Zimbabwean family on their way to town who decided to give us a lift. We climbed into the bed of the truck and enjoyed the breeze as we raced along the highway towards downtown. When we reached Harare, the man asked us through the back window of the cab where we wanted to go, and we told him Avondale Shopping Centre. It was a bit out of his way, but he was happy to take us there. When we reached our destination, we gave him a dollar each (the price of a combi), but he was shocked that we wanted to give him money for what he thought of as an everyday act of kindness. We ate lunch at a pizza place inside the mall – the restaurant looked like any you might see at a mall in the United States, and the food was excellent. After lunch, we walked around the nearby market, where stalls sold everything from paperback novels and pirated DVDs to clothing and wood carvings. Jude and I needed to get back to camp for activities in the afternoon, but everyone else wanted to stay in town for a while. The two of us walked to a nearby combi stop and crammed into the vehicle for the short ride to the main part of downtown. We walked past high-rises that contained banks, offices, and hotels while we were followed the entire way by a little girl demanding money. She stayed by our side for half an hour before finally realizing we weren't going to give her anything. As easy as it would be to just yell at the girl and tell her to leave us alone, it was important to remain calm – there were literally no other white people anywhere to be seen, and racial relations can be tense in Zimbabwe. We didn't want to draw a crowd of locals who might think we were harassing the little girl. We needed to make our way back to Bird Park, so we began hunting for a combi that was heading to Norton, the suburb where the park is located. We walked one block off the main street, and the orderly rows of glass and concrete buildings gave way to a chaotic mass of combis. We asked one combi driver after another if they were headed to Norton, and most either returned a quizzical look or gave us phony directions and demanded money for the lame advice. One driver finally said that he was going to Norton, so we crammed into the empty seats in the back of the vehicle. Luckily, we asked some of the people in the combi if it was headed to Norton, and they said that it wasn't. The driver had just given us the typical African "yes" and probably didn't even understand the question. We climbed back out of the combi and continued asking locals how to find public transportation to Norton. We kept the search up for close to an hour before finally breaking down and taking a taxi. It was ten dollars each, a cheap price for maintaining some sanity. We arrived back at Bird Park just in time for an afternoon speedboat safari on the lake. Our guide, the owner of the park, is a white Zimbabwean who is incredibly knowledgeable about the wildlife of the area. Like many white landowners in Zimbabwe, his citizenship was revoked and he has had to fight for his land. 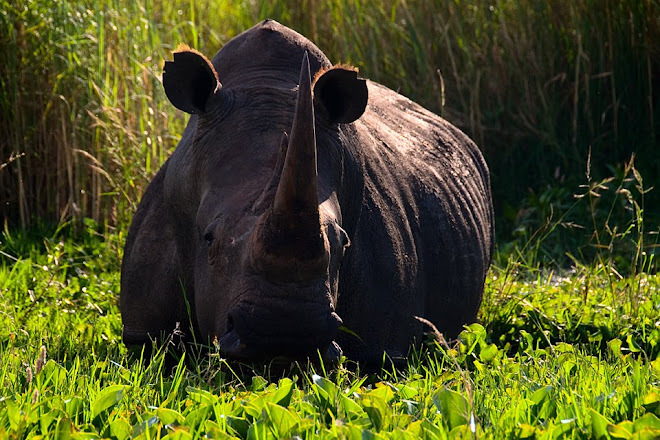 Such passion makes for an amazing guide, and he managed to get us within ten feet of three white rhinos grazing along the lake shore. Most animals are not scared off by watercraft like they are by land vehicles, so sneaking up to them is much more feasible by boat. We also saw zebras and several species of birds, including fish eagles, before returning to the campsite. A white rhinoceros stands at the edge of Lake Chivero near Norton, Zimbabwe. 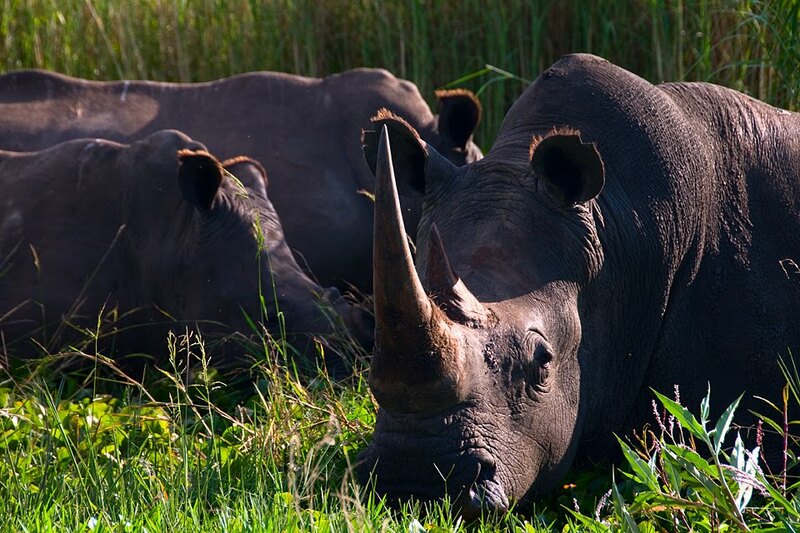 White rhinos stand at the edge of Lake Chivero near Norton, Zimbabwe. Next was a visit to nearby Lion Park, where we met a five-month-old and two seven-month-old cubs. We were given a brief safety lecture about how to behave around the lions, and then they were let out of their enclosure to go on a walk with us. Occasionally, one of the lions would flatten its ears and concentrate intently on someone's flip flops – their behavior is very similar to that of domestic cats. To prevent them from pouncing on our sandals with their razor-sharp claws, all that was needed was a quick distraction by a stick being drawn through the dirt. Like domestic cats, lions have a very short attention span. As dusk drew near, we said farewell to the lion cubs and returned to Bird Park to our "luxurious" dorm beds.